Step 1: Complete Facilitator Training: To ensure a high standard and consistent delivery of the SMART Recovery program, anyone intending to become a SMART facilitator must complete SMART Recovery Australian Facilitator Training (over two days). In order to be able to register your group, you must do so within two years of completing training. 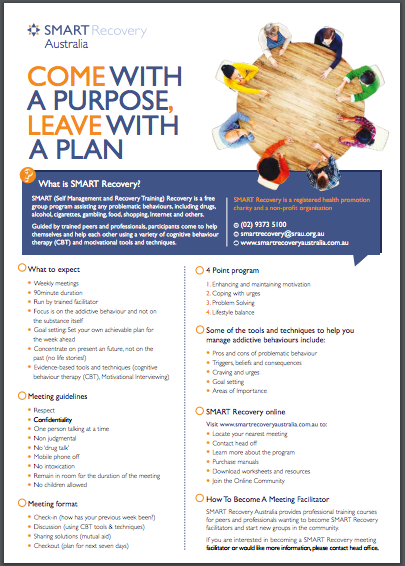 If more than two years have elapsed and you have not facilitated or co-facilitated a group in that time, you will need to attend the two-day SMART Recovery Australian Facilitator Training course course again in order to start a group. 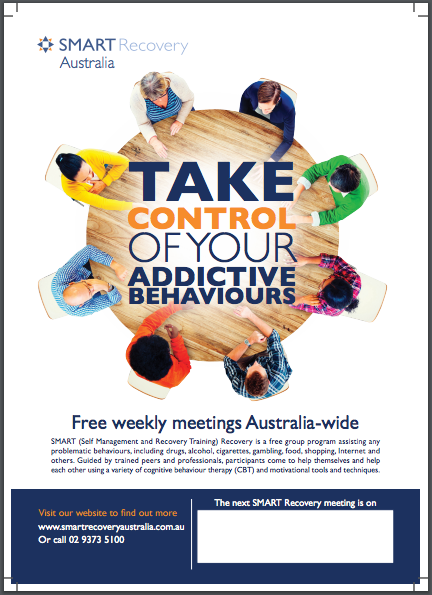 Step 2: Register your meeting with SMART Recovery Australia head office. Click here to complete the online Group Registration Form. Once your meeting is registered it will be added to our website. Important: If your meeting day, time or location changes, or the meeting can’t run for any reason, please notify head office: 02 9373 5100. Step 3: Promote your meeting: When SMART Recovery meetings first begin, attendance may be minimal. Don’t get discouraged – it can take time for the word to spread! We provide complimentary promotional materials (Brochures, Posters, and Participant Welcome Flyers) to all new meetings that start up, however, after these run out, we kindly ask that you or your organisation please print these yourself from our Promotional Materials page. There are three different promotional formats available to assist advertising your meeting. 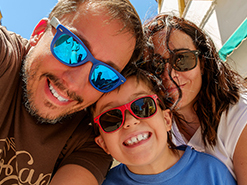 Let your local health services — including general practitioners, psychologists, psychiatrists, local hospitals, mental health agencies, drug and alcohol agencies, family and youth services, community corrections, Aboriginal and Torres Straight Islander services, gambling and other allied community centres — know about your meeting. Visit local agencies and speak with key staff about the program. With permission, hang a poster on their waiting room wall that indicates the time/day of your nearby meeting (print posters here). Leave brochures with staff and in waiting rooms. To find local drug and alcohol agencies in your area – you can contact ADIS. 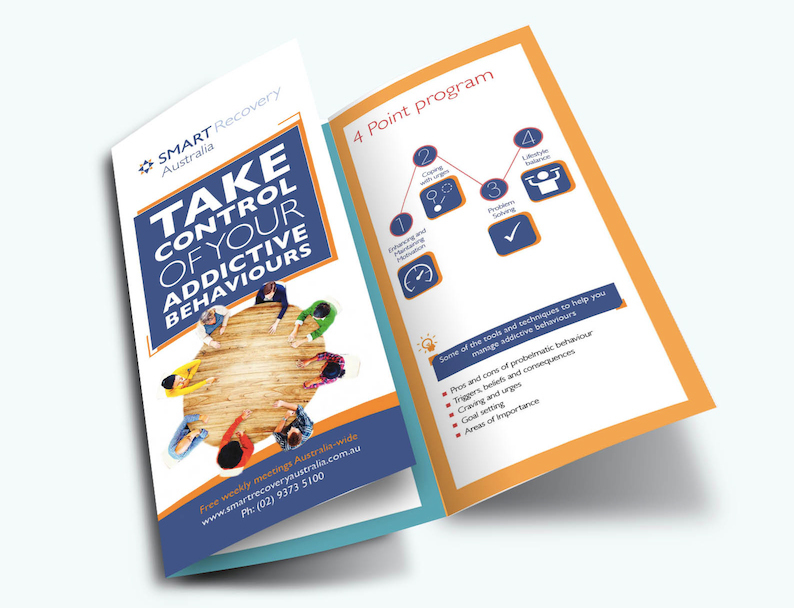 SMART Recovery is popular with psychologists, who are often looking to refer clients into evidence-based programs such as SMART. Google “Psychologists” and “CBT Therapists” in your area and make them aware of your meeting, give them access to brochures and flyers they can use to introduce the program to clients. Other places you could display posters and brochures include: Community noticeboards, probation and parole services, domestic violence services, Department of Family and Community Services (FACS). You can also place an ad or have an article put in your local newspaper. Your local print media and/or radio station may run a story for you. To obtain a media release that promotes the opening of your new meeting, contact head office at smartrecovery@srau.org.au. Already running a SMART meeting? We’d love to hear about how you promoted your group! Email your experience here! Community centres, church halls, scout halls, surf clubs, local council buildings, neighbourhood centres, libraries. You may be able to negotiate with the venue’s manager and offer to give them any money that you might collect from ‘pass the hat’ in exchange for the room. Be sure to mention SMART Recovery Australia is a non-profit charity organisation. Applying for Council grants: It’s also possible to apply for small grants with your local council to cover the cost of venue hire. Find an example of answers to typical grant questions here. You can also download and print an information pack about the program and it’s benefits here. If you need a letter, phone call or any assistance from SMART Recovery to help you secure a venue, please contact our head office. If you are planning on facilitating a group during the day it is best to do it within school hours as this allows individuals with school-aged children to attend the group. If you are going to facilitate an evening group, around 6pm is ideal as it allows people enough time to leave their workplace and get to the group before going home. While not compulsory, we highly recommend that there are at least two facilitators for each group. Working with a co-facilitator helps share the load and gives you someone to debrief with after meetings. This helps you reflect on and develop your own skills. On a practical level, it also means that you have backup in the event that you fall sick, take holidays or leave your place of employment where the group is being run. Peer Facilitators: We’re always looking for people with lived experience to become facilitators. If you believe a participant would make a great facilitator, encourage them to contact us. They’ll just need to have demonstrated that their addictive behaviour is under control for a minimum of 9 months before they can attend Facilitator Training. For assistance, support and advice, don’t hesitate to contact head office where your Area Coordinator will be happy to help with any needs. Tel: 02 9373 5100 (head office).